On April 30, 2007, Governor Christine Gregoire signed the legislation, declaring the Pacific chorus frog "the official amphibian of the State of Washington." The law went into effect on July 22, 2007. The Pacific tree frog (Pseudacris regilla), also known as the Pacific chorus frog, has a range from the West Coast of the United States (from Northern California, Oregon, and Washington) to British Columbia, in Canada. They live from sea level to more than 10,000 feet in many types of habitats, reproducing in aquatic settings. 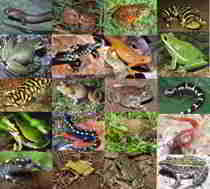 They occur in shades of greens or browns and can change colors over periods of hours and weeks. This small frog has a somewhat flattened body, narrow waist, long legs, relatively smooth skin and a pointed snout. Adults are usually less than 5.0 cm (2 in.) snout-vent length. Females attain larger sizes than males. Tips of the fingers and toes have sticky broadened circular discs called "toe-pads" that adhere well to smooth surfaces. The dorsal body color is typically green or brown, but can also be shades of gray, red, copper, or some combination of all these colors. A conspicuous dark mask extends from the tip of the nose through the nostril, eye, and tympanum to the shoulder. Frequently, two or three stripes run down the back and a "Y"shaped marking exists on the head between the eyes. These markings may be discontinuous, appearing more like spots or blotches or may be subtle or absent. Other dark blotches or markings may be present on the sides of the body and limbs. The ventral surfaces are mostly white, often with yellow to yellow-orange coloration on the legs and sides of the belly; mature males also have darkly pigmented throats with a translucent yellow wash and wrinkly skin. Newly metamorphosed Pacific Treefrogs look similar to adults. The tadpole has eyes on the margins of the head and a tail fin with a high arch that starts mid-way along the back and is rounded at the tip. The overall coloration is brown or olive usually with black speckling (but not inky black spots). The underside is white with metallic iridescence. Tadpoles grow to about 50 mm total length before metamorphosis. Newly metamorphosed Pacific Treefrogs range in size from approximately 12 to 18 mm snout-vent length. The eggs are laid in small loose packets of around 9 to 70 eggs. The egg packets are approximately 20-40 mm in diameter. Individual eggs, when fully expanded, are small with the ovum and gel together measuring less than 7 mm in diameter. Egg packets are typically attached to a brace, often vegetation; less frequently, they are laid directly on the sediments. Voice: Males produce a variety of calls in the breeding chorus including a two-part advertisement call, "rib-it"or "crek-ek," an enhanced male attraction call, and a trilled encounter call. The choruses are audible from great distances. Outside the breeding season, males produce a one-part dry land call. These calls are produced throughout the year except during the driest and coldest periods. 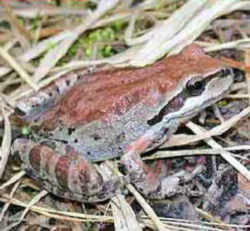 Pacific Treefrogs are the most commonly heard frogs in Washington. The Pacific Treefrog is easily distinguished from all other Washington frogs by the circular discs at the tips of the fingers and toes. Pacific Treefrog tadpoles are the only tadpoles in Washington that, when viewed from above, have eyes located on the margins of the head. 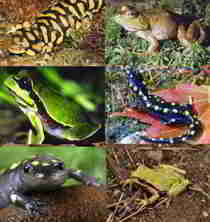 The eyes, especially in large tadpoles, stick out from the outline of the head. Warm winter rains appear to trigger migrations to the breeding ponds. Males arrive first. Chorusing takes place at night during the early part of the season and may continue during the day at the peak of the breeding season. Calling will cease if nighttime temperatures fall below 5Ãƒ‚°C (41Ãƒ‚°F). Calling may take place for several weeks before egg laying actually starts. Most egg laying starts in mid-February at lower elevations in western Washington and in April at lower elevations in eastern Washington. Breeding is later at higher elevations. Breeding at most sites is prolonged, up to 3-4 months. Eggs hatch in 3-5 weeks. Larval development typically takes 1 1/2 to 2 1/2 months to complete. The juveniles grow quickly and some are able to reproduce the spring following metamorphosis. 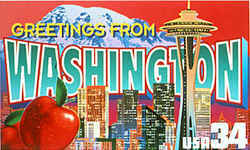 Overwintering behavior has not been studied in Washington. At low elevations on the west side of the Cascades, males call sporadically during the winter when temperatures are above 8-10‚°C (46-50‚°F), implying that they remain active throughout the winter. The Pacific Treefrog is the most widespread and common frog species in Washington and occurs in all ecoregions. Pacific Treefrogs are able to utilize a wide variety of habitats and persist even within urban and disturbed areas, where pockets of undeveloped habitat exist. In the Columbia Basin, their distribution is limited to areas with water. This species was not detected during an extensive herpetological inventory conducted at the Hanford Site in1996 and 1998. This is the driest area of the state and may exceed the species' tolerance limits. Pacific Treefrogs are able to use almost any type of still or slow-flowing water for breeding including wetlands, ponds, lakes, still water edges of rivers, slow flowing springs, irrigation ditches, road ditches, seasonally flooded pools and puddles, deep tire ruts, children's wading pools and spring boxes. Survival in seasonal water bodies can be precarious; water may dry up before tadpoles can complete metamorphosis. This species is prolific and the tadpoles are usually the most common amphibian larvae at any breeding site. Transformed treefrogs are terrestrial but need to be in moist microhabitats or near water. 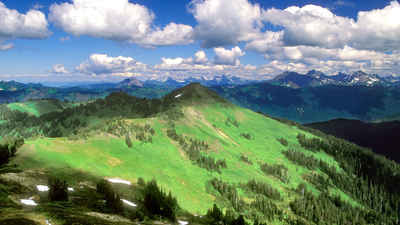 Terrestrial habitats include wet and dry forests, prairies, alpine areas, and both shrubland and grassland communities. Contrary to strict interpretation of their common name, they tend to be found on the ground or in shrubs. Much activity is nocturnal, especially at low elevations, but it is not unusual to find them out during the day. 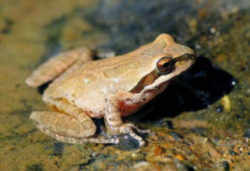 The Pacific chorus frog, Pseudacris regilla, is hereby designated as the official amphibian of the state of Washington.